Considering what was at stake in this match, it was no surprise to see Hibs start the game at 100mph, knowing that they had to avoid defeat against a dogged Hearts team hell bent on one final home win of 2017/18 against their rivals. 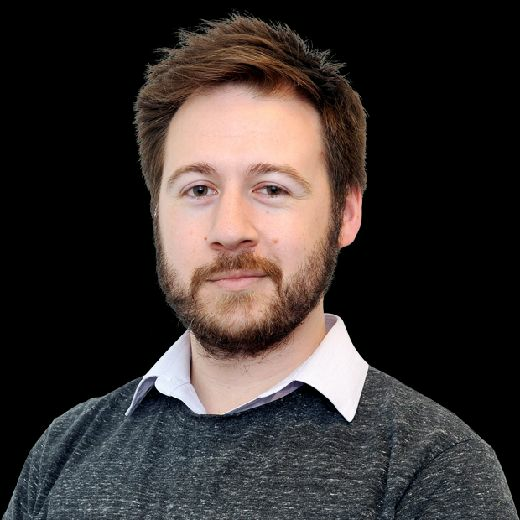 Time after time Brandon Barker danced down the left touchline but it wasn’t until the 16th minute that a swerving shot from the on-loan Manchester City winger asked questions of Jon McLaughlin in the Hearts goal. Yet despite Barker’s endeavours, Hibs appeared disjointed at times. The deft flicks and subtle touches that have been a feature of many of the Easter Road side’s impressive displays this season were absent. Scott Allan, so often a key component of Hibs’ lauded midfield, was a bit peripheral at times while John McGinn was prevented from dictating play by getting drawn into battles. 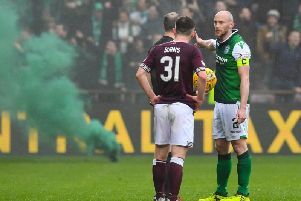 Whether it was tiredness, or psychological exhaustion, or simply the fact that Hearts had the upper hand over the course of the 90 minutes, Hibs looked like a team running out of steam. Despite his 19 goals, on many occasions this season Kyle Lafferty has cut an isolated figure up top for Hearts. He’s struggled for service and in numerous matches much of his time on the pitch has been spent chasing lost causes. But he led the line well last night, scored the opener, had a hand in the winner as he won the foul and didn’t give the Hibs defence a moment’s rest. There have been whispers that he could depart Hearts if the right offer for player and club comes in over the summer, but with Hearts having made the progress they have since Levein took the reins, he would be a big, big loss. His experience would be invaluable for Uche Ikpeazu and with a better, fitter team behind him for a full season, the Northern Irishman could enjoy an even more prosperous campaign next year. It was perhaps inevitable that Neil Lennon chose to shake things up, given the narrow width of the Tynecastle pitch and the likelihood of facing a dogged Hearts team keen on scuppering their rivals’ hopes of finishing second. But altering a successful formation that has produced results even with different personnel was surprising. For the first time in a number of weeks, Lennon went with one striker. Hibs have played a similar formation at Tynecastle before, and not scored. On top of that, breaking up the Kamberi-Maclaren partnership proved costly. True, Maclaren missed a penalty and passed up another gilt-edged chance at Pittodrie but the Australian striker would have been champing at the bit, not only to redeem himself, but to strengthen his World Cup chances. Maclaren’s absence also impacted Kamberi’s game. The Swiss striker worked hard as always but was far too isolated at times. The duo have combined well over the past few weeks, so why change a successful partnership? Hearts are an entirely different prospect with Harry Cochrane in the side. In the last league derby, his early exit through injury meant the Jambos were virtually toothless in the midfield. Last night, the 17-year-old ran the show. He doesn’t shirk tackles, his reading of the game is superb and his determination to get forward is invaluable for a team that at times over the past season has looked short of ideas. One move last night saw the youngster burst forward, come out on top in three block tackles and still manage to get a shot away. His setpiece delivery for Steven Naismith’s winner was pinpoint. Neil Lennon was unsurprisingly angry after the match. But his comments about the players being unprofessional do the Hibs squad a disservice and take the gloss off what has been a successful return to the top flight. A strong chance of European football, the semi-finals of the League Cup, a top four finish, victories over Hearts (twice), Rangers (at least twice), Celtic and Aberdeen points to a decent campaign. With Hibs still to face Rangers in the final game of the season, Lennon throwing his players under the bus and publicly raising doubts over his future, and in the immediate aftermath of a derby, isn’t a good look. It will be interesting to see how the fall-out develops in the coming days.